Ah, the season of White Sales. The season of glitzy indulgence behind us, our collective attention turns towards practical needs. Taking stock. Replacing tattered remains of the year past with an eye towards fresh, simple luxuries. While admittedly I pondered taking this column into metaphorical take on the preponderance of January white sales, I ultimately decided to rally with the retailers and offer suggestions for sprucing up your office once you’ve ditched your December conifer. Paper Source. From file folders with attitude (right) to coordinated file folders, organizers, journals and calendars, this site has the cure for the winter blahs and on-trend colors that excite and inspire. Russell + Hazel. Promising to “add life to your work,” this premium office supply boutique offers completely coordinated office solutions in contemporary style. In true White Sale tradition, their current promotion features Arctic White for the office, promoting crisp white as a way to freshen the look of your office. Browse online, or visit one of several Minnesota locations for ideas. Ikea. A homeowner’s staple, this store is equally relevant for the business owner. They’ve got everything for the office, from lobby furniture to magnet boards. My favorite product: Knuff, an elegant and functional magazine file for just $4.99. Got deeper pockets? 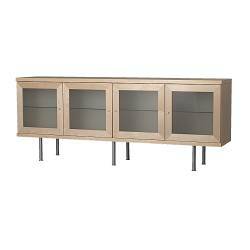 Check out the Bonde sideboard for office storage. I love this one! A huge array of discount art supplies for graphic arts, fine arts, painting, sketching, drawing, studio or home artist furniture and equipment, portfolios, photo albums and storage, handmade and printing papers, papers, pens and markers, fine writing instruments, calligraphy, mat board, foamboard, chipboard, basswood, and balsa, children’s supplies, unique creative gift ideas and much more. I feel like a kid in a candy store each time I walk in here, and the knowledgeable staff completes the experience. While you’re there, treat yourself to some Bienfang 360 marker paper (currently 40% off!). This entry was posted on Tuesday, January 6th, 2009 at 12:45 am and is filed under Business Practices, Uncategorized. You can follow any responses to this entry through the RSS 2.0 feed. You can leave a response, or trackback from your own site.